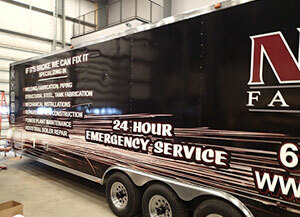 New England Mechanical Overlay’s industrial welding services include a mobile-ready crew of more than 100 welders and a fleet of custom trailers. From Portland, ME to Portland, OR, NEMO offers countrywide service. NEMO also makes it easy for you by managing details like employee accomodations or specialized equipment rental. Before they hit the road, each trailer is stocked with a set of tools and equipment tailored specifically for your project. The NEMO road crew is on-call 24/365 to respond to emergency outages. New England Mechanical Overlay manage your outages with a multi-step plan that will ensure the least amount of downtime. The NEMO Advantage is working with a company that can oversee all steps of the process, from NDE testing to repairs, maintenance, installation, and also fabrication. 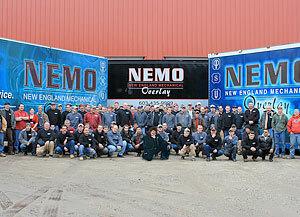 With NEMO you get three companies in one: New England Mechanical Overlay, NEMO Fabrication, and Harvard NDE. Whether it is a power boiler drum, heat exchanger, or water wall, NEMO has you covered when it comes to maintaining your pressure vessels and connected parts. Get on the schedule for periodic maintenance. If the support required is unexpected, our emergency road team can get your facility back up and running as quickly as possible. 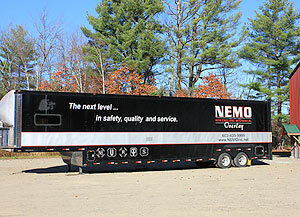 NEMO currently has a fleet of three custom tractor trailer rigs (purchased from NASCAR racers) that have been modified to store and transport a large assortment of equipment that has been specifically selected for your project. If there is a unique piece of equipment needed to facilitate a specific project, NEMO will handle the arrangements. New England Mechanical Overlay’s industrial welding services include a mobile-ready team of welders and a fleet of custom trailers. 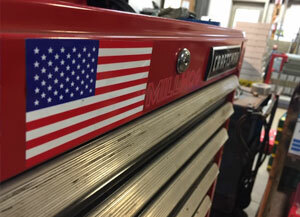 NEMO even employs a department that is dedicated to stocking and customizing each trailer with the tools and equipment needed to perform each contracted project. New England Mechanical Overlay employs over 100 expertly skilled welders ready to service your next industrial project or power outage. NEMO is an ASME stamp holder and is certified to perform work in a wide variety of industries. The NEMO Safety Standard was created to hold all employees accountable to one of the highest standards of safety in the industry. 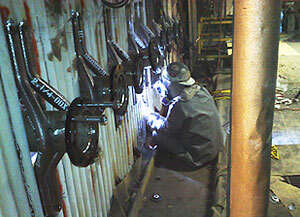 A workforce with the combination of skill, experience, and safety is part of the NEMO Advantage. 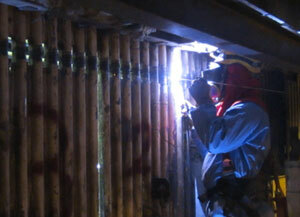 NEMO has a large inventory of equipment to facilitate almost any kind of outage, repair, or general maintenance. If a unique piece of equipment is needed to complete the job, rest assured that NEMO will handle the arrangements to make sure your job is facilitated in a timely and efficient manner. NEMO also employs an entire department dedicated to assembling, maintaining and stocking NEMO’s custom trailers with specifications taylored for your project.